In most any area, it’s generally best to look to the margins, not the center, for innovative thinking. Small space architecture is no different. Conventional architecture is too often big and boring, victim of zoning restrictions and/or design driven by the interests of developers rather than residents. One place to find consistently interesting “marginal” architecture is supportive housing–a type of government-funded housing for populations that need, ahem, extra support. Supportive housing usually enjoys less restrictive building code restrictions than conventional housing and because it’s not for sale, it is not necessarily bound to imitate what everyone else is doing in the market, often resulting in innovative, community-centric, compact architecture. La Casa Permanent Supportive Housing in Washington DC is a great example of such a beast. It’s an attractive, smartly-designed apartment building that happens to be supportive housing serving homeless men. The seven story La Casa was jointly designed by LEO A DALY and Studio Twenty Seven Architecture for the DC Department of Human Services. According to LAD’s website, they were challenged “to create a ‘home’ rather than an institution, and to ‘meet or exceed’ the quality of the adjacent market-rate apartments.” With bright, clean and smart interiors, their challenge appears to have been met. The building will house 40 chronically homeless men, all of whom will have their own furnished efficiency apartments with kitchens and bathrooms. 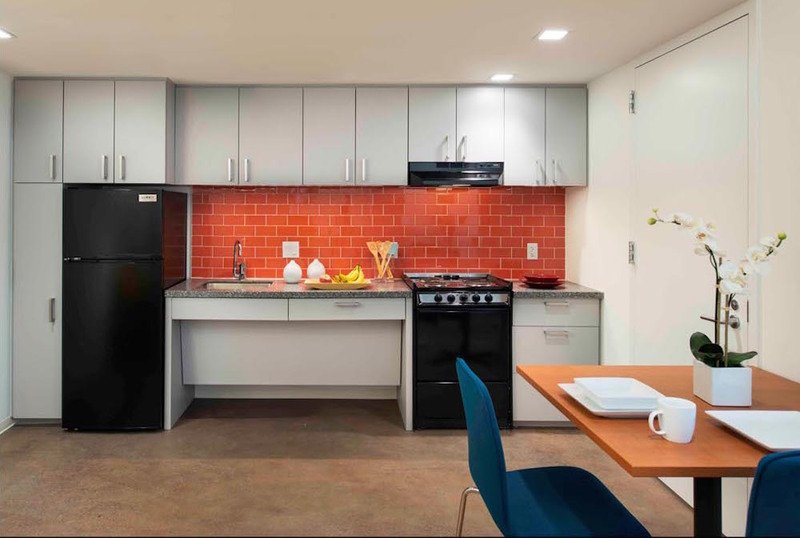 The units are designed to create a sense of home and permanency, rather than serving as a stopover in some institution in a never ending cycle of homelessness. It will employ the “housing first” service model. Whereas many supportive housing communities require sobriety or other conditions for eligibility, housing first has no such conditions, acting under the belief that when housing and counseling services are in place, it can provide the security and dignity that will act as gateways for an improved life. La Casa recently won the American Institute of Architects (AIA) 2015 Housing Award in the Specialized Housing category. The project is great because it’s not just a nice place for someone accustomed to living on the streets–it’s a great place for anyone to live. sh** that is the perfect layout and size for me…less is really more. IMO this as only for homeless is a great mistake, It is imperative to move away from housing with a stigma. What happens too many times and historically is creation of redlined new slums. While the aim is good It missed the real long term target. I have been homeless. But that does not mean I want to be discriminated against by address and zip code. Today employers can on the internet find out easily these projects and “not our kind” discriminate. I also would need to know more specifics. Please give specific s such as electrical out lets is there cable access,the apt rules and regulations. many such projects treat the renters as criminals and with constant inspections and bullying of the tenants. Historically micro apts help people start or restart independent living. But then often become down graded over the years as people need more space.